The iPhone 4S UK price has been confirmed and we've also had details of the iPhone 4S deals and tariffs from all the major networks. Without contract, he iPhone 4S UK SIM-free price has been made official by Apple, with the latest handset starting at £499 for the 16GB model in black or white, £599 for 32GB or a whopping £699 for the 64GB version. You can now pre-order the handset from Apple. The iPhone 4S UK release date is 14 October along with the US, Canada, France and Germany, meaning queues outside the Apple Stores around the country - but most people will want to know when their network will be stocking it. Read on for more on the latest iPhone 4S tariffs and deals by network. O2 has curtly told us: "The iPhone 4S will be available on O2 from the 14 October" and has promised more to come with regard to pricing. You can register for iPhone 4S on O2 updates. You can register your interest in the new iPhone 4S at shop.orange.co.uk/new-iPhone. Orange will be offering the 16GB iPhone on a two year contract with the handset for no additional cost if you are willing to spend £46 a month, while at the other end of the scale you will need to fork £309 for £20 a month over 24 months. For the 32 GB, a £20 a month, two year contract means you will need to fork out £449, and for the 64GB on the same contract it is £519.99. Similar to it's Orange stablemate, you can head on over to t-mobile.co.uk/newiphone to register interest in the iPhone 4S on T-Mobile. You can get the 16GB handset for no additional cost if you are willing to sign up to a two year £45.96 contract, or you can agree to a £25.45 24-month contract and pay £239.99 for the handset. Should you want the bigger storage phones then that networks' £25.45 a month contract over 24 months would mean you pay £379 for the 32GB and £449 for the 64GB option. There's a page about iPhone 4S on Tesco Mobile, suggesting it will be coming to the network, but as yet has released no furtherinformation. 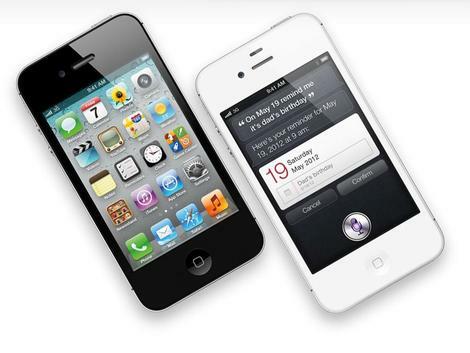 The iPhone 4S will launch on Three, but the network has refused to give any more specific information at this time. There is currently just an information page on its site. Virgin Mobile has not yet released any information about the iPhone 4S on its network. Vodafone will be stocking the iPhone 4S, and you can now pre-order IPhone 4S on Vodafone. The 16GB model is available on various 24-monthtariffs starting at £26 for a 100 minute, 250MB tariff - but you'll have to pay a whopping £359 for it. You can get the 32GB model on this tariff for £439 up front or the 64GB for £519. To get the 16GB handset free, you'll need to spend £46 a month and to get the 32GB version free, you'll need to pay a huge £62 a month. The 64GB model isn't available for free on any tariff. Our favoured tariff is the £36 a month deal for 600 minutes - though you will need to spend £159 up front on the 16GB handset, £239 for the 32GB and £319 for the 64GB version. All the handsets are also available on 12 or 18 month plans if you're prepared to pay through the nose for them.